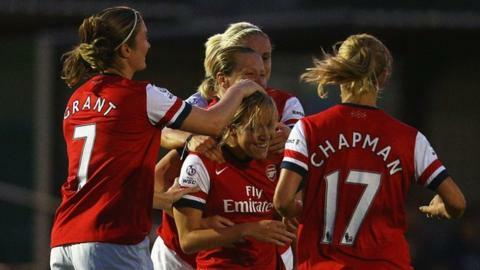 Arsenal booked a place in the Women's Super League's Continental Cup final with a 4-0 win at Bristol Academy. Gemma Davison, Kelly Smith, Rachel Yankey and substitute Jennifer Beattie were on target as the Gunners, cup holders, set up a repeat of last year's final against Birmingham City. Striker Davison hit a first-half opener, but the visitors did not have things their own way. The other three goals did not arrive until the final 20 minutes. Bristol started the game well and went closest to breaking the deadlock in the early stages, midfielder Jess Fishlock bursting through the middle but shooting just wide. At the other end, goalkeeper Siobhan Chamberlain had to save from left winger Yankey as the Gunners began to gain more possession. Defender Steph Houghton went close to giving the visitors the lead with a 23rd-minute header that struck the crossbar. And eight minutes later Houghton's long range free-kick brought an excellent save from Chamberlain. The goal that had been threatened came six minutes before half-time, with Davison pouncing on a half-cleared corner to drill the ball home. Smith sent a header wide then had a shot deflected for a corner as the visitors looked to increase their lead after the interval. Academy had a good spell midway through the second half, striker Natasha Harding having a shot cleared off the line before midfielder Melissa Lawley headed over. But the pressure on Arsenal was relieved when Smith hit their second goal with a spectacular 25-yard free kick that flew into the top corner. Five minutes later, it was game over as Yankey slipped a close-range shot under Chamberlain and into the net. And Beattie rubbed salt into the Bristol wounds with the fourth goal nine minutes from time, latching on to a Jordan Nobbs through ball to shoot home. The final against Birmingham, who beat Lincoln 2-1 in the other semi-final on Sunday, will be played on Wednesday, 10 October but a venue has not yet been set.